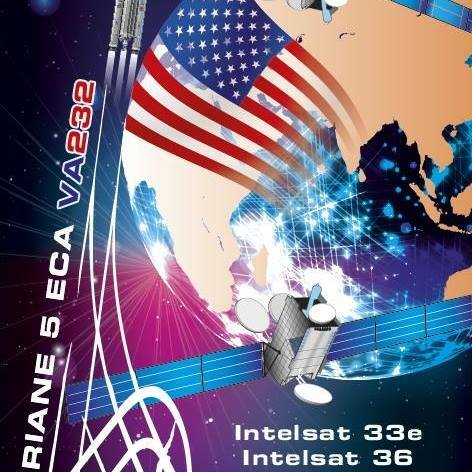 Hidden under Ariane’s payload fairing are Intelsat 33e and Intelsat 36 – both built by U.S. companies for operation by communications giant Intelsat as part of their fleet. Ariane 5 is set for liftoff from its equatorial launch site at 21:55 UTC, the opening of a 45-minute launch window to get the fourth Ariane 5 mission of the year underway. 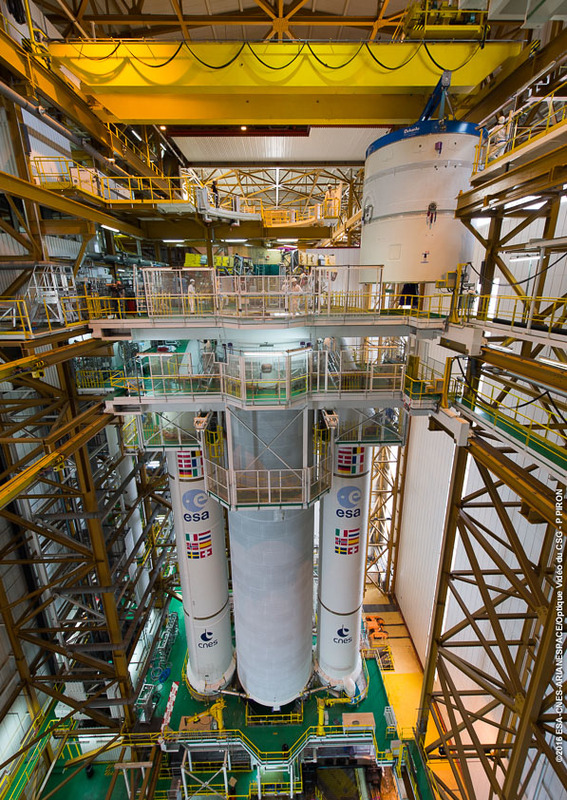 Wednesday’s hour-long flight will mark the 87th launch of the Ariane 5 rocket. Wednesday’s Ariane 5 mission marks the first time two Intelsat birds fly into orbit on the same rocket. 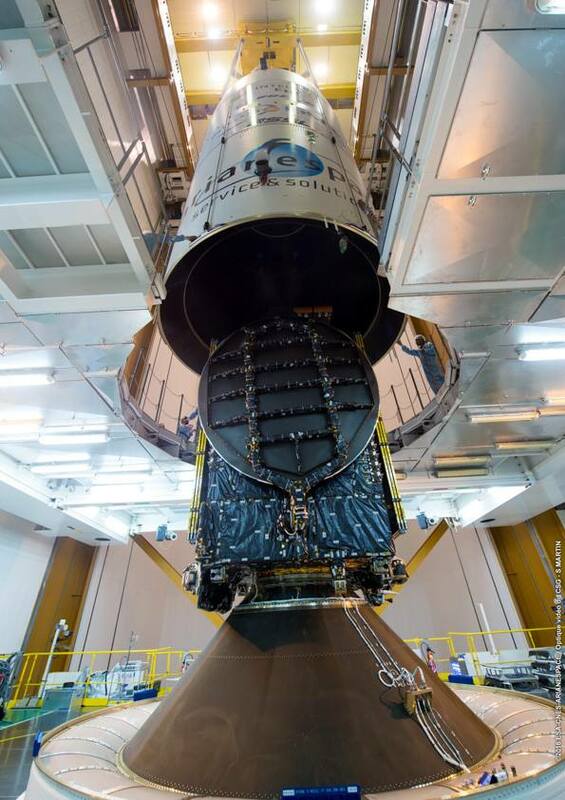 The larger of the two passengers, Intelsat 33e, is riding in the upper slot under the launcher’s fairing while Intelsat 36, the smaller of the two, is installed underneath Ariane’s Sylda adapter that allows the vehicle to launch a pair of satellites in a stacked configuration. The VA232 mission continues to push Ariane 5’s capabilities, setting a new performance record with a total payload upmass of 10,735 Kilograms – an increase of five Kilograms over the previous record set earlier in 2016. Intelsat 33e was built by Boeing based on the company’s BSS-702MP satellite platform. 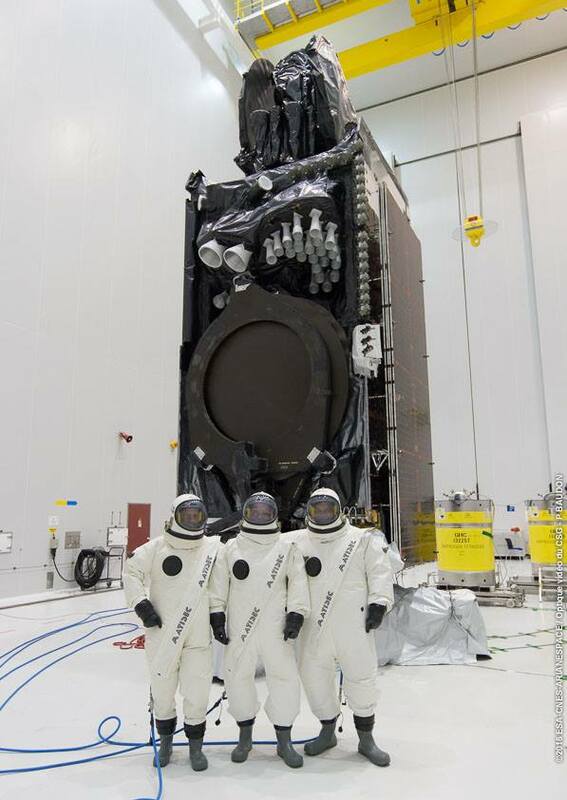 It weighs in at 6,575 Kilograms and hosts a powerful communications payload that combines wide C-Band coverage beams and high-powered Ku-Band spot beams to meet a growing demand for carrier-grade telecom, enterprise services and aeronautical connectivity. Spotbeam coverage is provided for Europe, Africa, the Middle East and Asia while the C-Band payload delivers services to high-traffic centers in Europe, Central Africa, the Middle East and Australia. In total, the satellite support a data throughput of 25 gigabits per second. 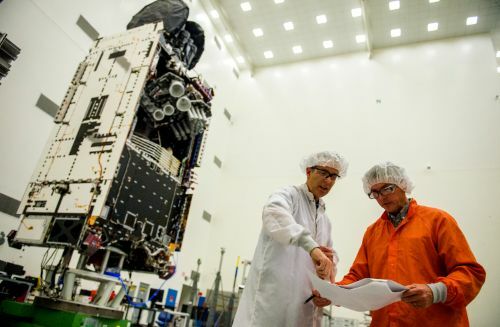 The Intelsat 33e spacecraft is part of the Intelsat Epic architecture that is promised to deliver global high-throughput services utilizing C-, Ku- and Ka-Bands, a combination of wide beams and spot beams as well as frequency reuse to provide a high degree of flexibility to customers. Intelsat 33e will be stationed at 60° East to replace Intelsat 904 that launched in 2002 and is approaching the end of its useful life. 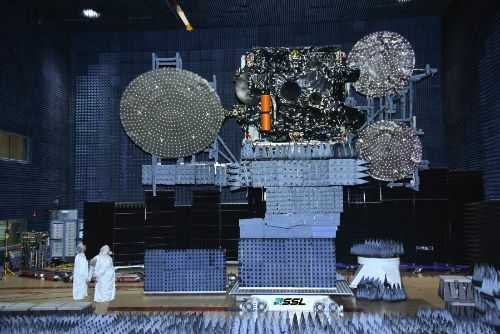 Intelsat 36 was manufactured by Space Systems/Loral using the LS-1300 satellite platform in its low-power configuration. 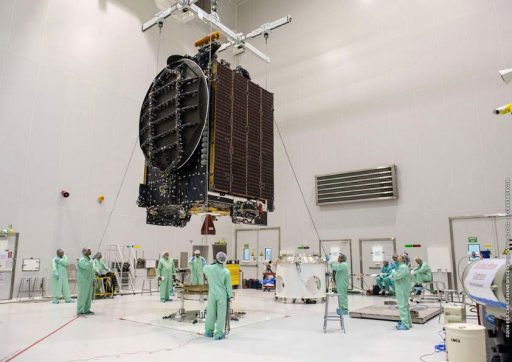 The satellite weighs 3,253 Kilograms at launch and will enter a slot in Geostationary Orbit co-located with Intelsat 20 to provide additional coverage from Intelsat’s premier Direct-To-Home (DTH) neighborhood in Africa. The satellite’s Ku-Band payload comprises 30 transponders which are utilized by MultiChoice, a leading pay TV provider in Africa. Ten C-Band transponders are available to customers providing coverage to African and South Asian cable communities. The Ariane 5 for this mission entered its assembly phase on July 9 when the 30.5-meter tall EPC core stage was installed atop the Mobile Launch Platform followed by the attachment of the twin boosters that were assembled at a separate facility, each already loaded with 237 metric tons of packed propellant. The ESC-A second stage was hoisted on July 15 to take its spot atop the core stage, setting Ariane 5 up for a series of tests before moving over to the Final Assembly Building to wait for its passengers. The two satellites were delivered by Antonov cargo planes in late July – Intelsat 33e flew in from Boeing’s factory in El Segundo, California while Intelsat 36 was shipped from Palo Alto where SS/L is based. Over the course of three weeks, the satellites were fueled for flight, completed a final round of testing and underwent fit checks with their respective payload adapters. The Intelsat 36 satellite was installed atop the second stage via its payload adapter while Intelsat 33e took its position atop the Sylda adapter before being encapsulated in the Swiss-made payload fairing. Next, the assembled stack of fairing, Intelsat 33e and Sylda was placed over Intelsat 36 and structural connections between the rocket, the Sylda and the fairing were put in place. 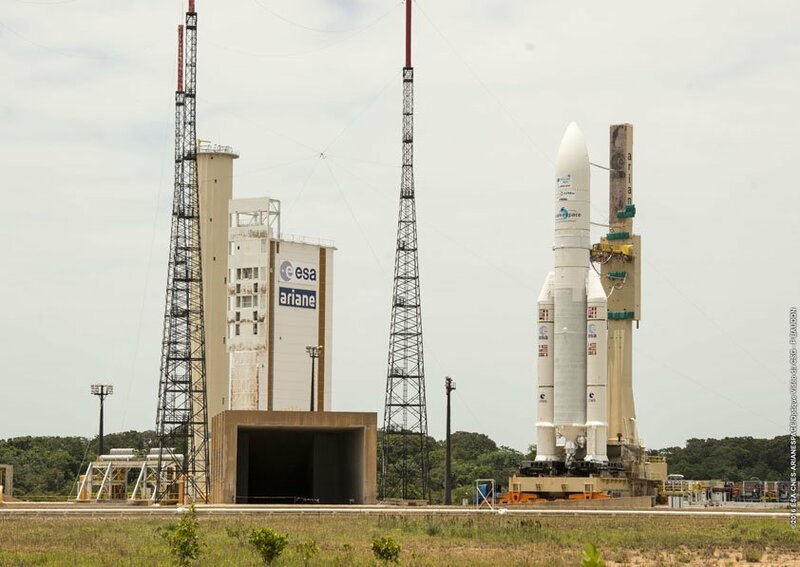 A countdown and flight rehearsal was conducted on Thursday and Ariane 5 was armed on Friday to set up for a Launch Readiness Review on Monday. Managers reviewed the status of the two Intelsat payloads, the Ariane 5 rocket and all ground support systems to clear the rocket for liftoff. Ariane 5 completed the 2.7-Kilometer trip from the Final Assembly Building on Tuesday, being pulled by a custom-designed tug to arrive at the ELA-3 launch pad. After rollout, Ariane 5 was to be connected to the pad’s propellant, power and data systems. Also on tap for the day before launch is the filling of the first stage’s high-pressure Helium tank and a series of close out operations at the launch facility. 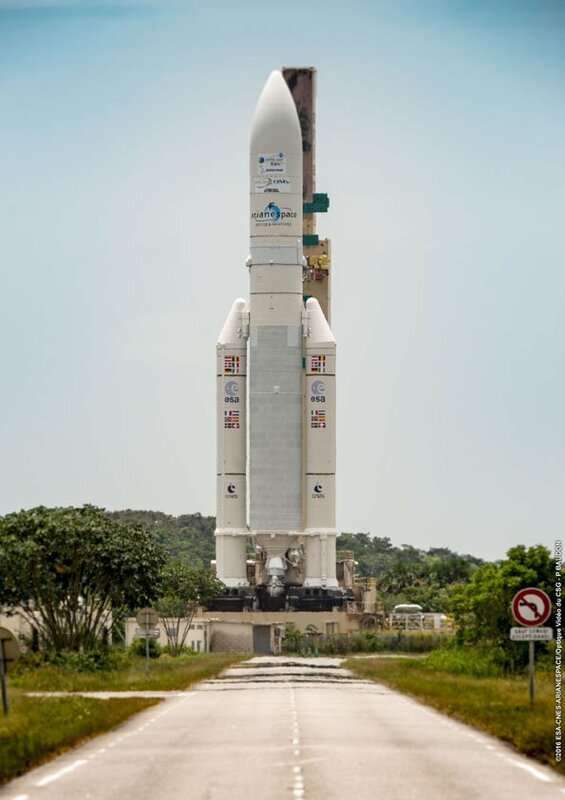 Countdown operations begin eleven and a half hours prior to the opening of the launch window when final preparatory steps at the launch pad are initiated to prepare the Ariane 5 rocket for propellant loading and button up all ground systems. The rocket is powered up at T-7.5 hours for a set of checkouts to confirm the vehicle is ready for launch prior to commencing tanking operations. Propellant Loading kicks off at T-5 hours with a chilldown of ground systems and tanks before Liquid Oxygen and Liquid Hydrogen can be pumped into the EPC Cryo Core and the ESC Second Stage. The two-hour tanking sequence will fill the vehicle with 174 metric tons of cryogenic propellants which will be kept topped up at flight level throughout the countdown. A repetition of systems checks occurs inside L-90 minutes and the two satellites switch to internal power half and hour before liftoff with final Status Checks at T-10 minutes to clear the vehicle for the Synchronized Sequence. The 7-minute computer controlled sequence will take the Ariane 5 through the reconfiguration of its flight control system, the pressurization of tanks, transfer to battery power and activation of pyrotechnic systems. When clocks hit zero, the Vulcain 2 engine will ignite to soar to a launch thrust of 960 Kilonewtons with seven seconds of engine monitoring before the twin Solid Rocket Boosters are ignited and Ariane soars off from its equatorial launch pad. Delivering 92% of Ariane’s total liftoff thrust, the boosters will quickly push the vehicle through the sound barrier with Mach 1 expected just 49 seconds after liftoff followed 20 seconds later by Maximum Dynamic Pressure. 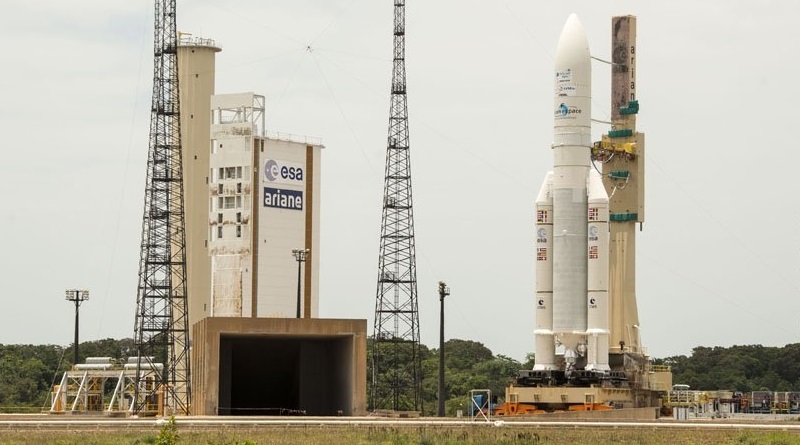 Ariane 5 will fly its usual departure, heading due east for a 20-minute overflight of the Atlantic Ocean followed by payload separation over Africa. The twin boosters will burn out at T+2 minutes and 23 seconds before separating from the Ariane 5 launch vehicle. Powered by the Vulcain 2 engine alone, the vehicle will depart the dense atmosphere for the separation of the Payload Fairing three minutes and 24 seconds into the flight. The first stage will shut down eight minutes and 59 seconds into the mission followed swiftly by the separation of the spent stage to clear the way for the ignition of the HM-7B engine. Soaring to a thrust of 62.7 Kilonewtons, the second stage will fire for 16 minutes and nine seconds, aiming for an orbit of 250 by 35,879 Kilometers at a 6.0-degree inclination. After injection into Geostationary Transfer Orbit, the stack will maneuver around for the separation of Intelsat 33e at T+28 minutes and 47 seconds to mark the start of its 15-year mission. The next step in the complex Ballistics Phase is an avoidance maneuver that is followed by the jettisoning of the Sylda payload adapter 30 minutes after liftoff to reveal the Intelsat 36 spacecraft. Intelsat 36 is planned to be separated 41 minutes and 50 seconds into the flight, released into a slightly different orbit than the first passenger. From there, the two satellites will part ways to enter their positions in Geostationary Orbit half a world apart to join Intelsat’s global satellite fleet. For Ariane 5, the mission ends after one hour with the usual avoidance maneuvers and passivation of the second stage by venting propellant tanks and powering down systems.